Clean, comfortable, spacious Fort Grounds apartment: great location! Welcome to our mid century-modern remodeled apartment! New kitchen appliances; new full kitchen and bath. Top-rated mattress, brand new hide-a-bed sofa. Super-fast WiFi, included Netflix and Amazon streaming, and a WiiU gaming system! Off-street parking included, in the most desireable neighborhood in Coeur d’Alene. A block to the beach, a strong frisbee toss to the best park in town. Close in to the new skate park/pump track/tennis courts, and a quick 5’ walk to all the best restaurants on Sherman Ave, right downtown. Comfy and cool all summer, heated in the winter. Private patio and entrance, all set to enjoy a comfortable North Idaho night. Private bedroom with queen bed, plus a hide-a-bed for a comfortable 4-person rental. This is a basement apartment, in a 1926 Craftsman home- as stated above, you’ll have your own entrance, and can park in the front drive. You’ll probably hear us walking around a bit during the day- the floors are original! We live on site, and are happy to welcome you to town and point you towards all the local favorite spots! This house is amazing- and the basement apartment where you will be staying is a perfect combo of old-school wood and new fixtures and furniture. Literally in the best location in CDA. The Fort Grounds neighborhood is a beautiful collection of craftsman homes; the original homes of CDA. City Park and Beach is just a house away; brand new park, pump track, skate park, and courts are a block away. Walk to downtown in a few comfortable minutes, through the park, to all the best food and shopping CDA has to offer. Head the opposite direction, and walk to NIC in two blocks. We offer off-street parking, great atmosphere, and reasonable rates to all who are looking! paper towels, dish cleaning supplies, etc provided. WiiU with 4 controllers and lots of games! 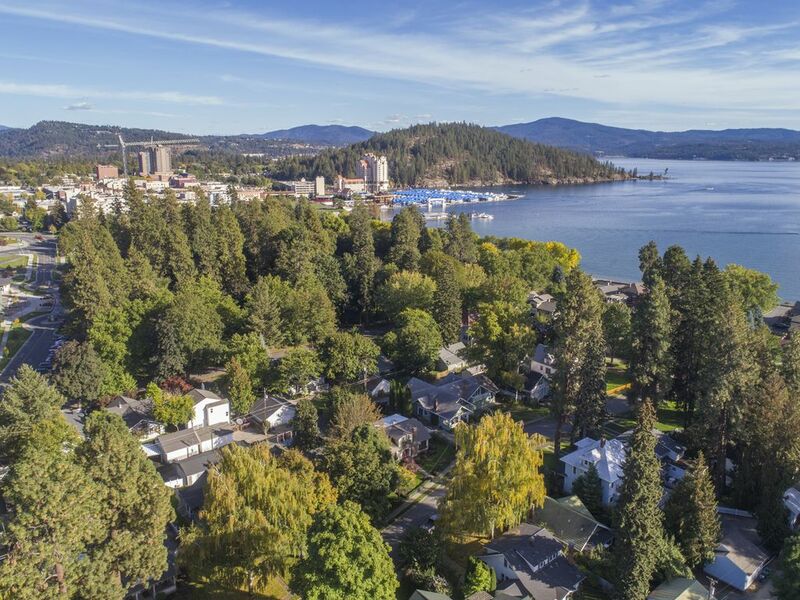 So close to everything CDA has to offer, and right in the best 'hood! This apartment is freshly refinished, and we are excited to share it with you! Enjoyed our stay here. Newly remodeled bathroom. Fully functional kitchen with necessary utensils, cookware, and some coffee plus few goodies were provided in the refrigerator. Mattress was awesome. As noted in the listing comments, some upstairs foot traffic was audible downstairs, only an issue once and the owner's kids kindly & politely curtailed their activities. No cable or local TV, but Netflix, etc was provided. WiFi good. Great location for downtown exploration and lake views are just down the street. Darling apartment! Perfect location, close to downtown, lake and Centenial trail. Apartment has all the necessities with an added decorator flair. Super cute and comfortable. Hosts are wonderful and helpful. Would definitely stay here again. This place is everything they advertise. It was so comfortable and close to everything in Coeur d’Alene. The neighborhood is delightful and the house is decorated as if it was in a magazine. Thank you for being great hosts. Great central location with downtown a few blocks away, but in a nice quiet neighborhood. Apartment was clean and comfortable with all that you would need. Owners were very helpful and friendly. Would recommend to anyone!